The Suite for piano was written in 1999. 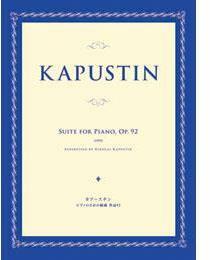 When Kapustin was composing the first movement, he thought it would be a separate piece. But soon it became clear that it would be a good idea to compose a few more pieces and put them together as a suite. This is how this four-movement work came about. The tonal scheme of the suite goes as follows: B-flat, F, D, B-flat, with the first three movements in major, and the last one in minor, although it also ends in major. One should note that typically he does not indicate key signatures in his music, with a few rare exceptions; this suite is one of those exceptions, and even there the key signature is present only in the first two movements. Interestingly, these two pieces were the last ones where he indicated the key signature; subsequently he continued to make do without it. The four movements have the following forms: 1. Compound ternary. 2. Simple ternary. 3. Compound ternary. 4. Sonata form. Some virtuoso elements are present in the middle two movements, but the only genuinely virtuoso movement is the finale in tempo presto. As a whole, the character of the suite is fairly conflict-free. As for jazz elements, they are present in all four movements, either explicitly or implicitly. What do you want to know about Suite op 92?